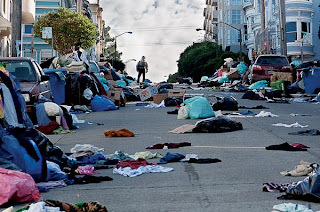 The Reel Rhino: Carriers over Contagion, Who'd a Thunk It?!? 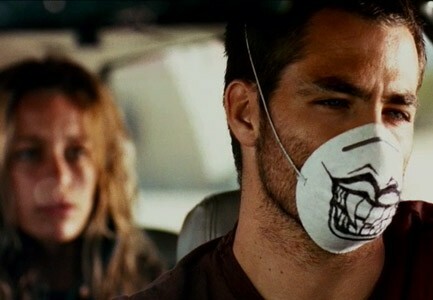 Thursday night, I decided that to generate some momentum for Steven Soderbergh's Contagion, I would check out Carriers. Ever since I dropped the DVD portion of my Netflix, I have been watching flicks I may have otherwise missed (and some that I would have rather missed!). I think this whole price change has worked out well for me, except that I had primarily used my DVD picks for flicks I couldn't find anywhere else. One of those being The Great Waldo Pepper, for example, which I first read about in William Goldman's book, and had a hankering to see. On the other hand, I did have the BluRay of The 400 Blows for 15 months, and didn't actually watch it...but lest I digress. Carriers stars Captain Kirk err...Chris Pine, that is, Piper Perabo, and Lou Taylor Pucci and is both written and directed by Spainish brothers David and Alex Pastor. 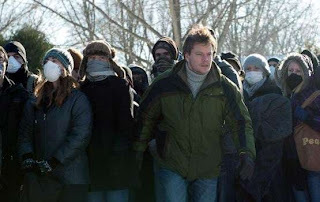 This is certainly a different kind of apocalyptic pandemic movie than Contagion, but as you will learn below, that is a good thing. I have spoke to several people who have started to watch it but said they turned it off because it was too scary. Folks, there are the infected who may look like zombies, but they are just sick people. It has some tense and scary moments, but really is more of a psychological thriller than a horror movie. The flick is very much a road movie at its core. A pair of brothers, one of their girlfriends, and another female friend are on the road, headed for a beach sanctuary that they believe will be disease-free and their last option for them to hide out and avoid those who have fallen ill. The film starts with much of the chaos past and basically shows us just the ravaged world from the perspective of the main characters. Yes, there are post-apocalyptic staples like the "carefree scene" in which they cruise around a golf course with no rules and no limits, blasting golf balls into building windows around the perimeter of the course. There are radio transmissions broadcasting information about supposed safe-havens, and even a mad doctor, who is still trying to sort things out, when clearly we are way past Robitussin. There are a lot of cliches for this type of film, but in the vein of Zombieland (minus the comedy), this film focuses on this small little band of folks trying to survive, and for that, I think it succeeds. 1. This movie stars a lot of really famous people. 2. This movie is competently shot and looks really pretty, especially in IMAX. 3. This movie offers nothing new to the genre of disease/plague/apocalyptic flicks, and for my tastes, plays out in extremely mundane and boring form. I expected a decent flick from Soderbergh and I hope this lackluster outing doesn't mean that we can expect similar from Haywire. Hopefully the stellar cast there and the introduction to a mainstream Gina Carano will be enough. Soderbergh has toyed with the idea of retiring, maybe he has lost his passion? And for something so dire, one would think that the stakes are pretty high. My complaint? You never feel it. There is no real sense of dread; there are very few moments of even slightly elevated tension. Everything happens so calmly and controlled, it feels at times you are watching a documentary on something you could really care less about. That is not to say that there aren't some decent story threads in the flick, it is just that the main thread, the Lawrence Fishburn/Kate Winslet CDC line, the main line that is, falls completely flat. The Matt Damon everyman who loses his wife and tries to protect his daughter from the disease has some decent moments of drama and light tension. The Marion Cotillard World Health Organizer investigator abroad has potential, but there is too little screen time with too little to hold on to, keeping you from feeling invested in her situation. Maybe the most potential was in the Jude Law, rogue-blogger plot line, but given the CDC-centric core and everything else I mentioned, it too gets so diluted that there is too little effect on the movie as a whole. Kate Winslet, Marion Cotillard, and Jude Law all have extremely dramatic moments, but, this film is a textbook example of how the whole of a film can make or break a performance. What are supposed to be poignant moments play out as check boxes, ticked as the director shot them. I actually think the strongest performances were the smaller bits put forth by John Hawkes, Jennifer Ehle, and Enrico Colantoni. It all falls flat due to a spineless center that does little to draw you in and make you feel any kind of emotion for these characters. Everything feels plain and in the end, you have watched a movie that looks nice, but leaves you devoid of any emotional ties. This film went too broad, and while a lesser quality of production, Carriers held together as a more watchable movie, because it gave you one set of characters to worry about. Contagion is an ensemble piece that very poorly gives you any reason to care for anybody in the troupe, or really even the separate parts on their own. In my opinion, wait to watch this one at home...there is too little to make the trip to the theater a worthwhile movie buck spent. Sorry I don't have a more thorough diagnosis on this right now, but I have been falling asleep too quickly when writing lately, and given how boring and plain this movie was, I fear if I keep writing, I may get stuck on the ZZZzzzzzzzz key. If you want to watch an entertaining film with a similar concept, check out Wolfgang Peterson's 1995 Outbreak. It was 1 part comedy, 4 parts frightening medical thriller reality, 4 parts government conspiracy, 1 part camp. It has just as strong a pedigree and it is actually an exciting movie to watch. 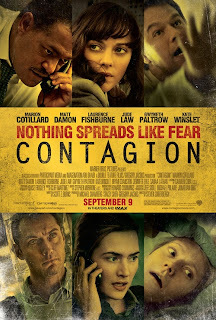 Maybe Contagion set out to be a serious version of the same type, but sadly, Soderbergh failed. Glad to hear you're on a William Goldman kick. I loved his book, and most of his movies. 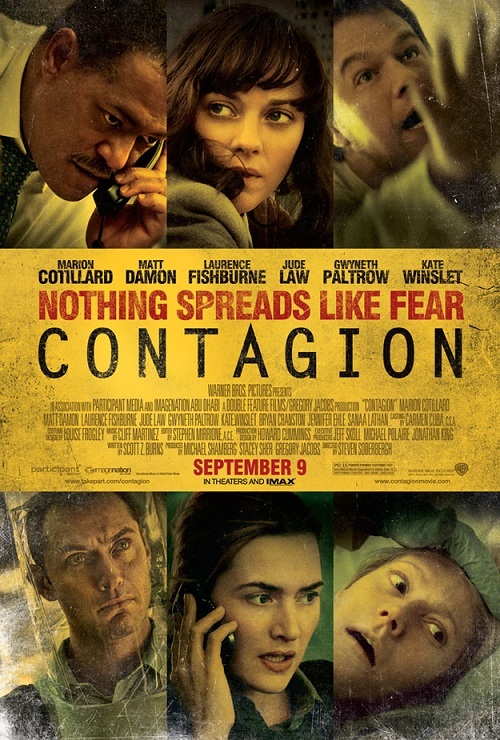 Sorry to hear about Contagion. I was looking forward to it. I will probably still see it.